The first plant in the world to produce carbon fiber parts in a speedy new mass production process will be “fully functional” in January. The $30-million facility in Walker, Mich., will feature custom-built presses using a proprietary out-of-autoclave technology developed by Plasan Carbon Composites. The process is being adapted by Globe Machine Manufacturing Co. (Tacoma, WA), which has already shipped seven presses to the Michigan plant. Gary Lownsdale said in a keynote address at the Society of Plastics Engineers Automotive Composite Conference & Exhibition (Troy, MI) that the plant will produce automotive parts for a single customer. He said he could not identify the part or the OEM because of confidentiality agreements. Initial capacity will be 30,000 to 50,000 vehicle sets per year. There are plans for a ramp-up to as many as 250,000 vehicle set per year. 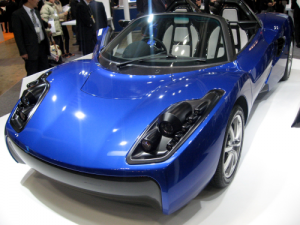 Key to the project is a reduction of carbon fiber reinforced plastic (CFRP) part cycle times from more than 90 minutes to a range of 15 to 17 minutes through process innovations that were taken from lab to real world by engineers at Globe, which has significant experience in the wood-composite industry as well as composite armor. Calvin Bamford, president of Globe, also spoke at ACCE2012 and only described the process in very vague terms. The “Rapid Cure System”, as he described it, has special thermal and pressure systems. One specific example of a process improvement that cuts time is a major reduction in post-press part temperature: from up to 190°F out of an autoclave to 105°F out of the new system. “Now parts can be handled immediately,” said Lownsdale. Previously, parts had to cool before they could be safely handled. “We are running the presses at the line speeds that are the most efficient,” Lownsdale said. “Seventeen minutes is the best time for this project. A nine-minute cycle time is our current target and we are closing in it very fast.” Future improvements will focus on chemistry. Use of thermoplastic matrix resins, for example, could reduce cycle times to two minutes. Also under investigation are lignin-based carbon fibers. Slightly more than 200 workers will be hired for the Walker plant. Production rates for CFRP systems now in use are about 5,000 vehicle sets per year. One part currently in production for example is a fender for the Corvette ZR1. The project is the largest capital investment in the history of Plasan, an Israeli company best known for its production of multi-material composite systems for armored military vehicles.